After strangely located seismic activity, you probably would like a shore-leave. Why not request a baryon sweep, so you can not only relax, but also return to a perfectly clean ship? Sounds too good to be true? Probably. The question you need to ask yourself is: clean of what? This question is easily answered by reading the Memory Alpha page on the baryon sweep. Therefore, I quote: “A baryon sweep was a procedure used to eliminate baryon particles from a starship.” So if I read this correctly, the sweep removes either certain – or all – baryons, which emit radiation, which is harmful in large quantities. Maybe you haven’t had it in physics yet, never got to it or simply forgot? But either way, the definition of a baryon is vital to understanding why I was so skeptical about the removal of baryons. 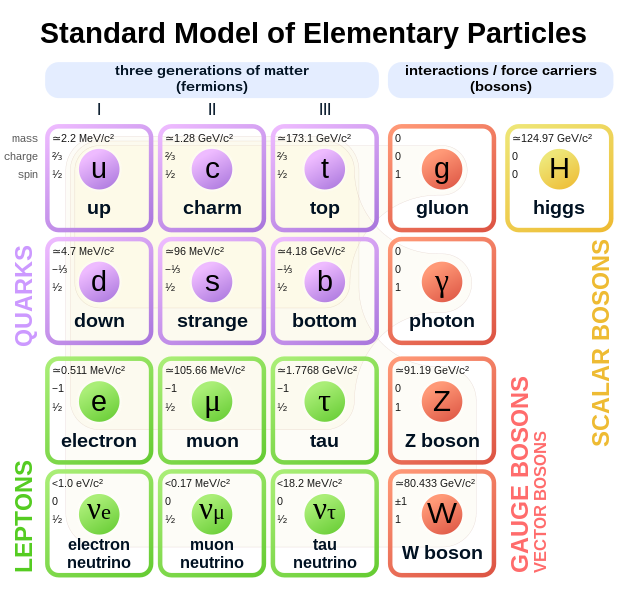 First, what is the standard model? If we break everything we know down to what we now think are the building blocks for everything in existence, we get the colourful chart you see to the right. I am absolutely not going to bore you with the details! The important part is the purple region, where you’ll find the quarks. Baryons are all particles made up of ‘three quarks’. Actually this is not true, because the quantum world is a crazy party, but with ‘three quarks’ we mean three quarks that are not cancelled out by their antiquark counterpart. How many are there? Doing the math like I would have done with take 3 out of 6 quarks – in which order does not matter and recurrences are allowed – I would have come to ((6-1+3)!)/(3!*(6-3)!) = 1120 types of baryons. However, some combinations are impossible and there are colour issues and a whole lot of things one could consider when asking this question. So somewhere between 75 and infinite. The baryon sweep definitely does not remove all baryons. Two of those who-knows-how-many baryons we all have heard of: protons (uud) and neutrons (ddu), the particles that make up all atoms we know! (With the help of electrons.) Removing all baryons means that you would literally shred any ship to pieces until all you have left are electrons. So all these other baryons, how do they come to existence? Well, just like most things come to existence in quantum physics; you smash particles together, which probably happens when you travel at warp speed. So does the baryon sweep remove all baryons other than protons and neutrons? I wish I could say yes, but probably no. Some baryons have this ‘strangeness’ which allows them to live long – something multiplied by 10^-10 seconds. That is really long for a baryon, but by the time you’re out of warp speed, all the baryons other than protons and neutrons have died! Their lifespan is not even close to a second. Removing the baryons is not necessary, because they already died long before you could initiate such a procedure. THEN WHAT DOES IT DO? My friend hypothesized the baryon sweep removes only free baryons, so baryons that are not in an atom. Given what baryons decay into, these are protons and neutrons. Protons are the only stable baryon. Bare protons we also know as a hydrogen ion. Supposedly they survive and stay on the hull, they pose no threat because they are stable and therefore do not emit any type or form of radiation. Neutrons, however, have a lifespan of about 920 seconds and do decay in what we know is beta decay, which is harmful. So my friend’s hypothesis made sense, but what about my own? I stayed a little closer to science fiction and endless possibilities in the universe. What if this is the part where we get hypothetical? Warp speed not only smashes particles together hard enough to create rare baryons, but also enables them to combine to new sorts of ‘atoms’. Just like a neutron is not stable outside of a nucleus, but could be inside, other baryons could – when combined – also become stable. Just like we have unstable atoms made up of protons and neutrons, there are unstable atoms made up of other or additional baryons. These atoms hypothetically could survive long, build up and pose a threat when not removed regularly. So what is it? Well, up till now there are two hypotheses: First, my friend’s, which says it removes free neutrons and possibly protons too. Then mine, which says there could, hypothetically speaking, be other sorts of atoms made up of rare baryons, which could be harmful when not removed. Either way, we can tell what it is not. It does not remove all baryons nor does it remove free baryons other than protons and neutrons (does not necessarily mean it does remove free protons and/or neutrons). Sorel Kaidun is also known under the nickname the Professor. Not only because of his love for Doctor Who, but because of his natural instinct to teach and educate. His real name is Kaiden. 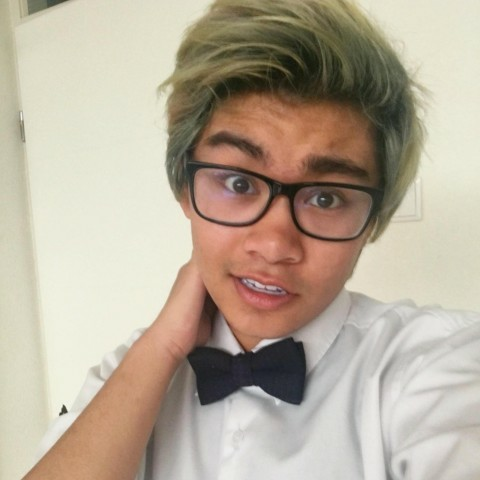 He is an 18 years old science (fiction) enthusiast from the Netherlands. He is currently still figuring out whether to become a teacher, an AI researcher or neurologist. Either way, he has got a long way to go, but he is boldly going.